On a hot summer day, when you and some of your closest buddies are running to the nearest lake to cool off, you don’t ask questions. You just jump in. Similarly, when one of those buddies tosses you a bottle of soap because you are a dirty mess (hypothetically, of course), you accept it willingly. 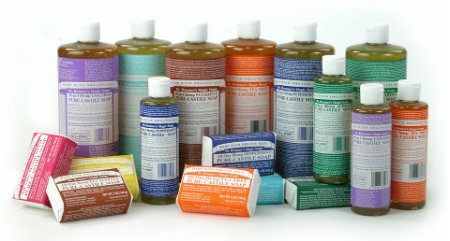 It was in such a situation, over 9 years ago, that I met Dr. Bronner’s soap. This may sound a bit melodramatic, but permit me to explain. As my friends and I tended to be during the summer, we were sweaty, dirty, and usually had dried paint all over ourselves. Getting clean wasn’t difficult. When I first went for the soap my buddy offered me, I thought…that smells like my mother's potpourri, aka it was lavender, the strong scent of lavender. The next thing I noticed was how concentrated it was; I needed very little to lather it up. And then, how effective. It dominated the paint that usually clung tightly. All it took was a little soap, and I’d saved time and came out smelling strongly like a field in Provence. I started buying the soap on my own when I was back home the rest of the year. That’s when I found the writing on the bottle. Dr. Bronner apparently had some staunch views about the world and polytheism, new agedness, etc. And he plastered them all over the bottle. Reading through was a bit dizzying, but I decided to stick with the soap, ‘cause it worked so well. And to the greater extent, I have to this day. I’ve intermittently tried other soaps, but his old recipe (he started making soap 150 years ago) still works as good as anything I’ve tried. What’s amazing is that it’s also all-natural and organic. It works well for washing yourself, your hair, pets, cleaning around the house. The stuff just works. And you don't need a whole lot to do the job, so it typically lasts quite a while. Even though you may spend a few extra dollars, what you're buying lasts for a ridiculously long time. I had three smaller-sized bottles and two larger bottles that, together, lasted me one year of showering (a few times per week). So, I’m going to keep buying Dr. Bronner’s as long as I can. And I’m thankful that Travel Country carries it in house, so that once a year or so, I can return and stock up.